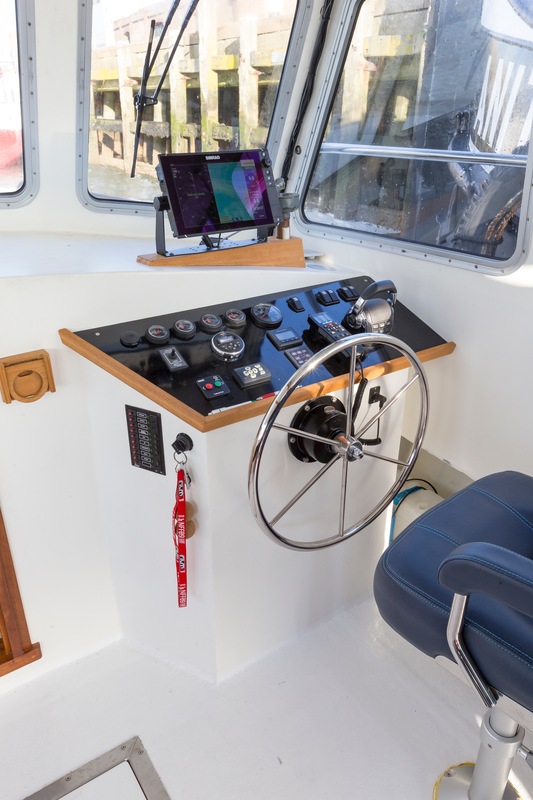 This Northern Bay 38 Lobster boat has been built in The Netherlands by Perry Kuiper, who developed this type in cooperation with John F. Hutchins of Down East Boats in Penobscot, Maine (USA), builder of the legendary Northern Bay 36. The boat has a very fast S-bilged hull that gives a smooth, stable and seaworthy ride, allowing high top and cruising speeds with a single diesel engine. Built to workboat specs., using first class materials and heavy duty parts. A boat suitable for daily use offshore or inland, pleasure, fishing, diving. She runs like a Cadillac. The boat can hold up to 10 people. The boat includes a removable canvas top that provides shadow in the cockpit on sunny days at sea or inland waters. Also lots of storage space under the cockpit benches. Hull shape: S-bilged Hull material: Polyester, Balsa Construction: sandwich method Engine: Volvo Penta D9, 500 hp / 2600 rpm Propellor: 3 blade 28 inch Steering: Hydraulic, commercial dual ram Propshaft: Seatorque ST-200 Wiring: 24 and 220 volt Length: 38' Beam: 13'4" Draft: 3'10" Radar: Simrad 3G Radar Plotter: Simrad NSS12 EVO2 Combo with built-in GPS positioning AIS: Simrad NAIS-400 Class-B Communication: VHF radio telephone Simrad RS90 Other electrical equip. : shore power inlet, inverter, bow thruster, bilge pump, anchor winch Windows: aluminium framed Outside equipment: anchor, cockpit cushions, swimming ladder, life raft, 10 life vests, fenders, mooring ropes, front and rear deck lights, searchlight, hooter, 4 window wipers Inside equipment: radio, wheelhouse speakers, heating, detachable wheelhouse table, cushions, mattresses, led reading lights, led roof lights DisclaimerThe seller offers the details of this boat in good faith but cannot guarantee or warrant the accuracy of this information nor warrant the condition of the vessel. A buyer should instruct his agents, or his surveyors, to investigate such details as the buyer desires validated. This boat is offered subject to prior sale, price change, or withdrawal without notice.